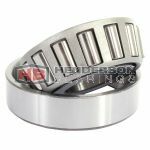 Tapered roller bearings comprise solid inner and outer rings with tapered raceways and tapered rollers with cages made from pressed steel. These bearings are not self retaining and consist of the inner part called the cone and the out part known as the cup, as such they can be fitted independently of each other. Edit your search with the navigation software on the left of the page.